What information do I / we collect? I / we collect information from you when you request an appointment for an Angel Reading, pay for an Angel Reading, subscribe to my newsletter “Victory of the Angels”, sign up for a webinar, respond to a survey, leave a comment on my blog, or fill out a contact form. Any data I / we request that is not required will be specified as voluntary or optional. You do not have to register yourself to visit my website. You may, if you choose, visit my site anonymously. Many people do. When requesting an appointment for an Angel Reading, you may be asked to enter your: name, possible requested times for your appointment, e-mail address, mailing address, phone number, credit card information or Birthday. 2) To improve my website. 3) To improve client service. Your information, whether public or private, will not be sold, exchanged, transferred, or given to any other company for any reason whatsoever, without your consent, other than for the express purpose of scheduling an appointment for an Angel Reading, paying for an Angel Reading, subscribing to my newsletter “Victory of the Angels”, or signing up for a webinar when specifically requested by the client. 5) To administer a contest, promotion, survey or other site feature. The email address you provide when requesting an appointment, may be used to send you information and updates pertaining to your appointment. 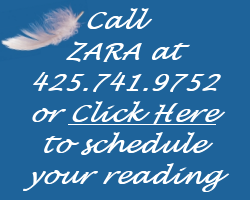 The email address you provide when subscribing to my newsletter “Victory of the Angels” may be used to send you information and updates pertaining to ZARA, Angels, spiritual counseling in addition to receiving occasional news, updates, promotions, related product or service information, etc. I / we implement a variety of security measures to maintain the safety of your personal information when you request an appointment, sign up for a webinar, or subscribe to my newsletter. I / we offer the use of a secure server. All supplied sensitive/credit information is transmitted via Secure Socket Layer (SSL) technology and then encrypted into our Payment gateway providers database only to be accessible by those authorized with special access rights to such systems, and are required to keep the information confidential. Because I / we value your privacy we have taken the necessary precautions to be in compliance with the California Online Privacy Protection Act. We therefore will not distribute your personal information to outside parties without your consent. I / we are in compliance with the requirements of COPPA (Childrens Online Privacy Protection Act). I / we do not collect any information from anyone under 13 years of age. My website, products and services are all directed to people who are at least 13 years old or older. I / we have taken the necessary steps to ensure that we are compliant with the CAN-SPAM Act of 2003 by never sending out misleading information.